This project is a return to the source of Swing. A retro semi acoustic line up of rhythm guitar, double bass and solo guitar - a solid Parisian Manouche formation, to which is added some drums and piano and a sprinkling of horns. Jazz that makes you want to dance… Lucy unwittingly brings elements from all her previous experiences as a performer making her a captivating live artist. Is Lucy Dixon the female reincarnation of Fred Astaire? She wouldn’t mind in the least. Astaire is her idol, her model, the man whose films with Ginger Rogers first got the little Lucy interested in tap dancing and singing. 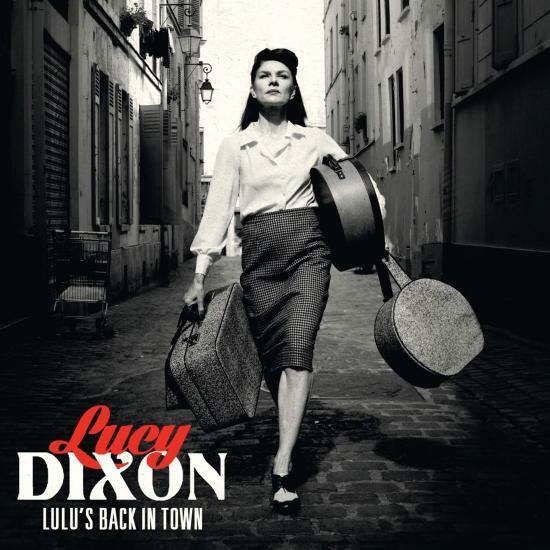 Now living in Paris, the London-born and -bred Dixon has just released her third album, aptly titled “Lulu’s Back in Town.” Following a year-long stint at the Lido in Paris many years ago and time spent on the London musical comedy stage, she hit the road as a dancer for the Stomp troupe. After 15 years of on-and-off touring, she was ready to settle down and chose Paris as her new hometown, in part because of her fond memories of her year at the Lido. Since her return to Paris, she has been singing and tap-dancing her way into the hearts of Parisians, performing regularly at the Sunset-Sunside and New Morning jazz clubs and other venues. The new album, her third, is a compilation of her stylings of American swing music, mostly from the 1930s and ’40s, backed by a trio consisting of lead and rhythm guitars and a double bass. Her distinctive voice and the trio’s arrangements, often jazzed up with a good dose of Django Reinhardt-style manouche, can be heard these days on the French radio stations FIP, TSF and France Musique. Onstage, Dixon is a song stylist and a singer with style but she goes far beyond just singing songs. She loves clothes and dresses up differently for each concert. “It’s important to me not just to look like someone from the ’40s but to combine what’s relevant with what’s irreplaceable from that era.” Since her trio has no percussion instruments (she’d had her fill of drums with Stomp), she sometimes provides a little percussion herself by tap dancing or beating a small drum. From the little suitcase she brings onstage, she sometimes pulls out a few props to dramatize a song.